Right now, I'm in the middle of reading Kisses from Katie which loads of other people have reviewed. I'm not finished with it thanks to a teething toddler and a tummy bug in the house not to mention some sewing projects. So far, it's really lovely. I must admit that I tend to shy away from books like this usually. I have the tendency to be a little too scrupulous and think, "If I'm not feeding the poor in Africa like Katie then I'm a total failure at charity!" 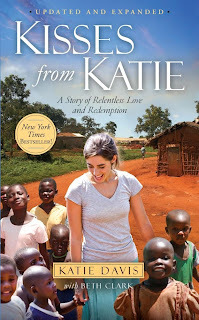 But what I've really liked about this book so far is that Katie makes it very obvious that God inspired this deep love for the Ugandan people in her heart and it's made me take a few looks around at what God has inspired in my heart that maybe I'm just not listening to. For example, we have a CFCA sponsor child (from Uganda actually) and just the other day we received a letter from her telling us about her scores in school and how they were really bad this past term because she'd been sick. I was inspired to call CFCA and ask if we could find out how she was doing now and whether this was a serious illness or not. I was also inspired to think about those I know here in town who are sick right now and talk to the children about what we could do to help them. Katie's story is an amazing one, but it's her story and it's not going to be like anyone else's story. But that doesn't mean my story isn't just as meaningful. Of course it is, because it's mine. God gave it to me. I need to listen to Him and follow His inspiration. My sweet Sunshine has been asking to read it and with some kids still feeling puny, I don't know if I'm going to be able to finish it soon enough for her. If you've read it, could you let me know if there is anything in it that a sensitive 14 year old girl might be traumatized by? Thanks! I encouraged my own daughters to read it (16 and 13), but it was during the school year when they were overloaded with other things and neither did. They are both reading a lot this summer, so I need to mention it to them again. It is a faith-filled book and while reality there is really harsh, I can't think of anything that was inappropriate for a teenager to read. I know that I immediately told my own kids they should read it, so even while it was really fresh on my mind from just having read it, I felt it was a good book for them to read. Certainly there are sad things happening there. I guess it depends on how sensitive she is (and probably also what things upset her most), but I personally think that Katie is a very sensitive person, and that's how she ended up in this ministry. :) My own opinion (and it's just that, my OPINION) is that it's okay to have your heart broken for the right things, but I in no way know your daughter or your circumstances, so I can only say that I felt it was a good thing for my own teenage daughters. Everyone is different, and there is no way you can 'unread' it, just like you can't 'unsee' things that you see, so I appreciate your caution. The saddest things I remember are people, usually mothers, not being able to afford food or health care for themselves and their children. There are some details of sores caused by illness, things like that.